In March 2010 the Minister for Communications and IT, Steven Joyce, announced the Government's final Rural Broadband Initiative (RBI) proposal and after asking for expressions of interest, a RFP for the RBI was issued in August 2010. Telecom and Vodafone submitted a joint bid for the RBI in November 2010. In February 2011 the government announced it would enter into commercial negotiations with Telecom and Vodafone and a final agreement to deliver the RBI was accepted by the Government on the 20th of April 2011. For more details about the Government's RBI objectives and the tender process please visit the Ministry of Economic Development website. By working together, Telecom and Vodafone are not only able to deliver on the RBI objectives in terms of broadband speed, coverage and service but also to extend mobile voice, SMS and data coverage where little or no service currently exists. Telecom and Vodafone will utilise a substantial existing base of assets in rural New Zealand to take coverage achieved by the RBI funding even further. By maximising their existing assets, capability and expertise, Telecom and Vodafone will be able to get the RBI rollout underway with the fastest possible start using proven, future proofed technologies. Under this agreement with the Government, Vodafone and Telecom will build and deliver open-access rural broadband infrastructure that delivers 100 Mbps connections to approximately 750 rural schools and 6 hospitals, and a minimum 5Mbps fixed and wireless broadband service to more than 80% of rural homes and businesses. More information about which schools will be covered. More detailed information about the other areas included in our plans to enhance rural broadband coverage will be available on the Telecom Wholesale website closer to the start of deployment in July. More information about what Vodafone will deliver under the RBI. Telecom's role in the RBI is building and delivering the fibre-based infrastructure and services. Telecom's network company, Chorus, will build the fibre and fixed line broadband (DSL) network. This means adding approximately 3,100km of new fibre, building on the 27,000km Telecom already has in the ground. This new, open access fibre will make about 40,000 lines into rural homes, halls, sheds and offices, capable of broadband for the first time. The proposal also includes the installation or upgrade of approximately 1,000 cabinets, extending Telecom's Fibre to the Node programme to deliver broadband speeds of over 10Mbps deeper into rural New Zealand - from 84% of total lines up to 92%. Half of all rural lines will be able to access urban-like speeds of over 10Mbps and over a third will be able to access speeds of over 20Mbps. Other service providers will be able to access the RBI fibre Chorus deploys by re-selling a wholesale end-to-end service over DSL or putting their own infrastructure (co-locating) in cabinets and/or exchanges to offer broadband services. Both of these methods are already used today by ISPs including Vodafone, TelstraClear, Callplus, Slingshot, Orcon, Actrix, Farmside and others. 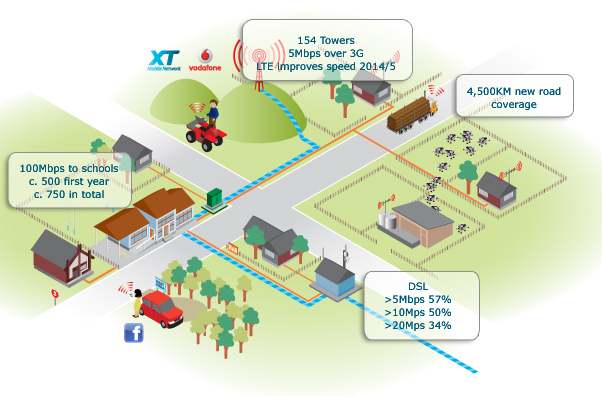 The proposal includes the installation or upgrade of approximately 1,000 cabinets, extending Telecom's FTTN programme to deliver broadband speeds of 10Mbps deeper into rural New Zealand - from 84% of lines up to 92%. Telecom and Vodafone are committed to collaborating with regional stakeholders to create opportunities to reduce deployment costs and extend broadband reach even further, while stimulating demand for rural broadband services. Telecom and Vodafone will engage with regional stakeholders through a series of regional meetings whose purpose will be to share information and gather feedback on rollout plans, identify collaboration opportunities for funding, delivering and extending rural broadband services, and encourage stakeholders to promote their constituents' awareness of and interest in the Rural Broadband Initiative. Regional stakeholders targeted for these meetings will be local authorities, economic development agencies, iwi and other Maori entities, lines companies, wireless broadband providers and user representatives. How has the Government ensured that giving the RBI to Vodafone/Telecom won't create a duopoly in rural NZ, and will instead encourage competition? How has the Government ensured that rural New Zealanders will be getting the best and future-proofed technology? How has the Government ensured stimulation of further, and ongoing, investment - more than just the basic requirement of the RBI - into rural New Zealand? How can other companies use the RBI infrastructure to compete? Has the Government ensured the fastest possible delivery of broadband to rural New Zealanders - could other providers, particularly existing local entities, have done things more quickly? Considering Telecom and Vodafone are building on existing infrastructure, which was not RBI funded, is there a chance they could effectively 'ring-fence' areas and stop other providers accessing those places? 1. How has the Government ensured that giving the RBI to Vodafone/Telecom won't create a duopoly in rural NZ, and will instead encourage competition? The Government requires all of the RBI-funded infrastructure to be open access, which means it will be available for competitors to build their own competing services. Both fibre and wireless components will be available on an equivalent basis to access seekers and wholesale customers, allowing any party to offer a retail service over the new infrastructure. This means an immediate boost to rural competition from different technologies and service providers. For example, the six retail mobile operators, including 2degrees and TelstraClear, who currently serve their customers by reselling wholesale mobile services from Vodafone will benefit directly from any extension to Vodafone's network. Telecom will pay the same fees as any other user of the Vodafone-built open access mobile towers. Whilst working together at the infrastructure level to ensure a minimum of unnecessary infrastructure duplication, Telecom and Vodafone will be fierce competitors for rural customers. 2. How has the Government ensured that rural New Zealanders will be getting the best and future-proofed technology? The agreement with Telecom/Vodafone ensures the design, build and delivery of future-proofed infrastructure. At a fixed level, it is designed to enable fibre-to-the-premise (FTTP) and the adoption of new technologies. At a wireless level, the service will launch with the best 3G technology using frequencies capable of delivering a high quality service to rural area's. It is important to note that, while 3G is a step in the upgrade path to LTE, successful deployment of LTE to rural New Zealand will require the use of lower frequency spectrums which provide greater reach. These frequencies are not currently available as they are used by analogue television transmissions. There are plans in place to upgrade to an LTE service once the frequencies become available - they are due to be auctioned by the Government in 2013. 3. How has the Government ensured stimulation of further, and ongoing, investment - more than just the basic requirement of the RBI - into rural New Zealand? The agreement with Telecom/Vodafone already includes significant further investment into rural broadband, on top of the Government's $300 million, bringing the total investment through this proposal to around half a billion dollars. The Government money pays for the underlying infrastructure build and then Telecom/Vodafone's additional investment goes towards the regularly upgraded fast-evolving technology that runs over this infrastructure. In addition, the pricing for infrastructure construction is 'open book', which means that even more rural infrastructure will be built if the actual construction costs are less than currently planned. Telecom, Vodafone and many other service providers are already fiercely competitive at a retail level. It is not practical to consider standing still and there is no history to suggest we would do otherwise. 4. How can other companies use the RBI infrastructure to compete? 5. Has the Government ensured the fastest possible delivery of broadband to rural New Zealanders - could other providers, particularly existing local entities, have done things more quickly? Vodafone/Telecom's build programme extends significant existing infrastructure, and builds on the capability and experience of many years building and designing telecommunications infrastructure. This gives them the capability to make a very fast start. For example, in the first year, 60% of the rural schools covered in the proposal - which is over 80% of rural students - would be connected to fibre giving them access to broadband speeds of over 100Mbps. The agreement also includes a framework for community collaboration that Telecom and Vodafone will use to help direct investment to where it has the greatest value for communities, lower deployment costs and leverage additional community investment to extend broadband coverage even further. 6. Considering Telecom and Vodafone are building on existing infrastructure, which was not RBI funded, is there a chance they could effectively 'ring-fence' areas and stop other providers accessing those places? No there will not be any 'ring-fencing' of any upgraded, existing equipment. The whole basis of the joint build is open access for all grant-funded infrastructure with wholesale services available over upgraded equipment, regardless of whether it is grant-funded or not. © Copyright Telecom 2019. All rights reserved.